Its only 28 byte, after downloading, put the file into the folder directory that you want to index. For example, perhaps you put it on your movie collection folder. After that, click once and let this script runs itself, note: you must have “administrator” privilege to run it well. This is an example result of indexing that saved in .txt format on the same directory folder. 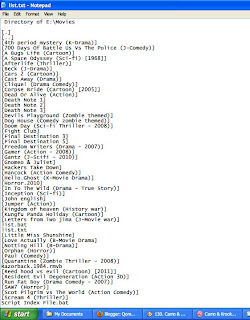 Result Image after scanning on my movie list…. So, its easy to do.